Despite a 2-point decline, majority of Filipinos still trust Vice President Leni Robredo, results of a Social Weather Stations (SWS) survey showed Tuesday. Vice President Leni Robredo, continues to enjoy a "good" net trust rating of +38 from +40 in June this year, according to the poll held in September. 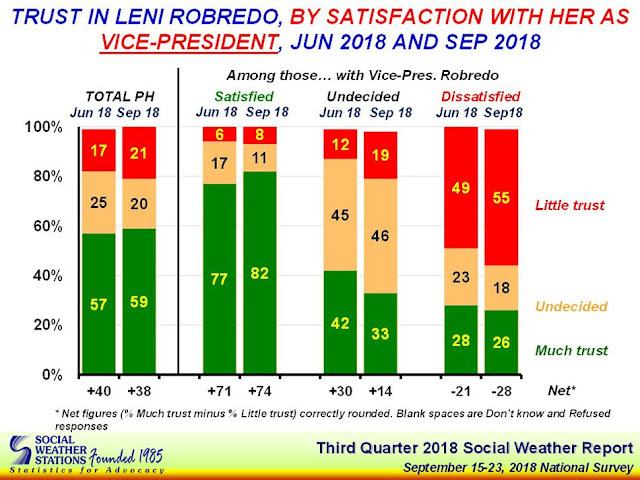 Fifty-nine percent of Filipinos have "much trust" in Robredo, 20 percent are undecided while 21 percent have "little trust" in the vice president. Trust in Robredo is directly related to satisfaction with her as vice-president, the pollster noted. 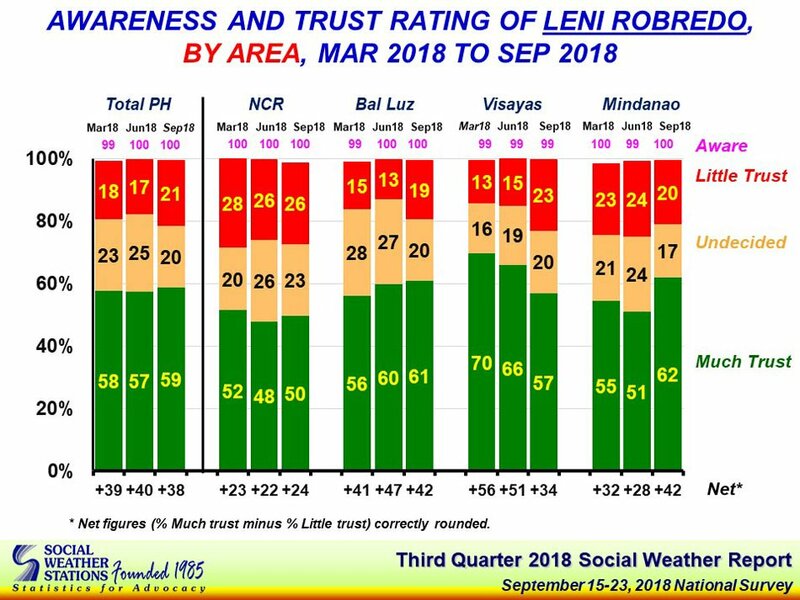 SWS explained that the 2-point decline in Robredo's net trust rating was due to decreases in Visayas and Balance Luzon which offsetted gains in her rating in Mindanao and Metro Manila. 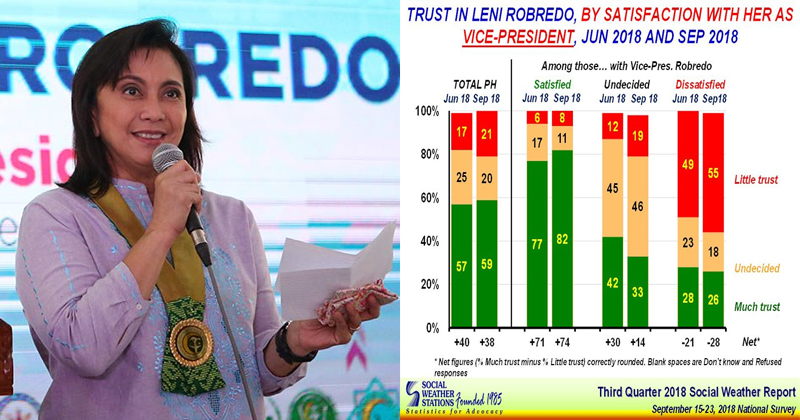 Robredo saw the biggest increase in her trust rating in President Rodrigo Duterte's bailiwick Mindanao where she received a 14-point increase to +42 "good" from +28 "moderate" in June. However, her trust rating in Visayas fell to +34 "good" from +54 "very good," down by 17 points. 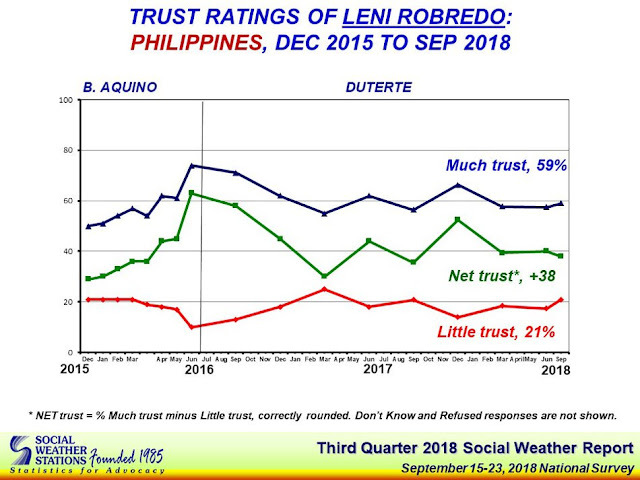 Her trust rating in Metro Manila meanwhile stayed "moderate" despite a 2-point increase to +24 from +22 in June this year. The Sept. 15 to 23 survey was conducted using face-to-face interviews of 1,500 Filipino adults nationwide and has a +/-3 percent margin of error for national percentages. Robredo is the current leader of the opposition which launched its Senate ticket last week. She is currently fighting an electoral protest filed by former senator Ferdinand "Bongbong" Marcos Jr. who lost to her by 263,473 votes, in what was the closest vice presidential race in recent memory.